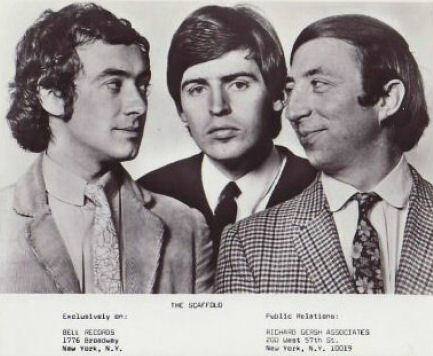 The Scaffold were Mike McGear, John Gorman & Roger McGough they performed a mixture of comic songs, comedy sketches and the poetry of McGough, Which can be heard on their 1968 live album, they also released a number of singles on Parlophone and EMI between 1966 and 1971. Since none of the Scaffold were musicians they used a backing band for live appearances initially they used a band called The Business who were later replaced by the remnants of Elastic Band. Mike and Andy were at some of the recording sessions of the Scaffold however it is impossible for him to know which bits were used in the final product.